The 18-acre Hilton San Diego Resort & Spa is situated in the Mission Bay Aquatic Park, within two miles of SeaWorld and Old Town San Diego. The resort features a nearby beach and a range of recreational facilities, including a fitness center. Besides an outdoor lagoon-style swimming pool, three spa tubs, and a children's wading pool, guests can also enjoy five lighted tennis courts, and a basketball court. 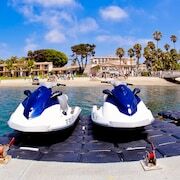 Boat and watercraft rentals are also available from the resort’s full service marina (surcharge). Spa Brezza has nine treatment rooms, and offers a retail boutique, a hair and nail salon, men's and women's locker rooms, indoor and outdoor meditation and relaxation lounges, beachfront and al fresco services, and a private rooftop sundeck. Spa services include massages; facials; and nail, hand, and foot care. Children's services are available as well (surcharge). (Advanced reservations for services are recommended). Children can make new friends at the kids' club (surcharge, open seasonally) where they’ll enjoy organized activities designed especially for kids (ages 5 to 12). 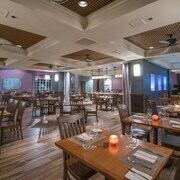 Acqua restaurant offers alfresco dining, and adults can relax with a cocktail by the fire at The Olive bar. A seasonal poolside restaurant, 3 bars/lounges, and a coffeehouse are also on site. A business center is open 24 hours a day and complimentary wireless Internet access is available in public areas. 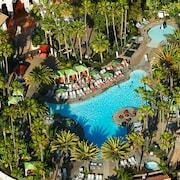 Hilton San Diego Resort & Spa is set among tropical gardens and close to sandy beaches on the shores of Mission Bay. 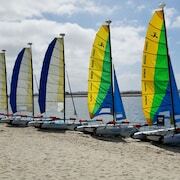 This 18-acre resort is just 2 mi (3 km) from Sea World San Diego, with easy I-5 access. 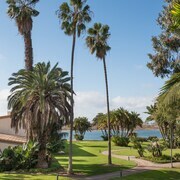 The resort features a nearby beach with marina, as well as the full-service Spa Brezza, a lagoon-style pool with spa tubs, and 5 tennis courts. Acqua offers al fresco dining and Mission Bay views. 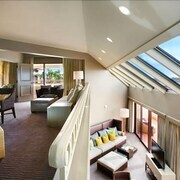 Guest accommodations at Hilton San Diego Resort & Spa blend Mediterranean-inspired architecture and modern style. Rooms offer satellite LCD TVs and compact refrigerators. Hilton San Diego Resort & Spa offers 357 air-conditioned accommodations with MP3 docking stations and laptop-compatible safes. Pillowtop beds feature down comforters and premium bedding. 42-inch LCD televisions come with premium satellite channels and pay movies. Refrigerators and coffee/tea makers are provided. Bathrooms include shower/tub combinations, complimentary toiletries, and hair dryers. In-room wired and wireless Internet access is available for a surcharge. Business-friendly amenities include desks and complimentary weekday newspapers, as well as phones; free local calls are provided (restrictions may apply). Additionally, rooms include irons/ironing boards and blackout drapes/curtains. Microwaves and hypo-allergenic bedding can be requested. Housekeeping is provided daily. 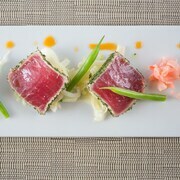 Acqua - This restaurant specializes in American cuisine and serves breakfast, lunch, and dinner. Guests can enjoy alfresco dining (weather permitting). A children's menu is available. A'roma - Onsite coffee shop. Open select days. Olive - This bar specializes in American cuisine and serves dinner and light fare. A children's menu is available. Open daily. 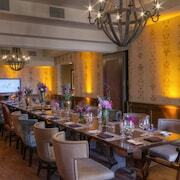 Frescos - This poolside bistro serves lunch and light fare. Guests can enjoy drinks at the bar. A children's menu is available. Open select days.